Update: thank you to everyone who joined us for this sold-out workshop! We’ll be running another soon; you can sign up for notifications here. 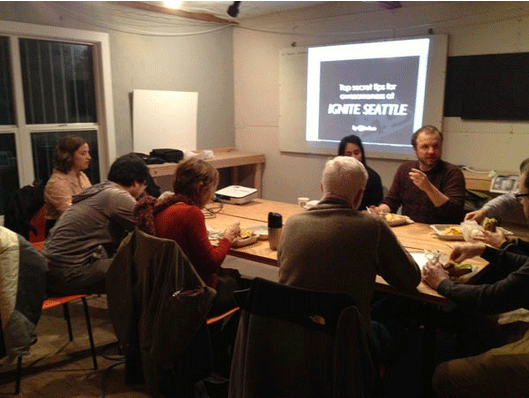 Ignite Seattle thrives on diverse ideas and challenging stories. We think everyone should give public speaking a shot, and we’re hosting a workshop to help you do that! Your coach will be professional speaker and Ignite Seattle emcee Scott Berkun. In addition to giving 20 to 30 lectures and keynotes each year, he wrote the bestselling guide to public speaking, Confessions of a Public Speaker. Invite your friends and family to be in the audience. We’d love to have them in the audience to support you. Tickets are inexpensive and it’s a great night. You can use this video to help explain what Ignite Seattle is like. On Facebook, go to our event page for Ignite Seattle #37, mark yourself as “going” and then share it out to your network. You can directly invite people to attend and you should! Big news: my talk on “<Insert your amazing talk title here>” will be part of the next Ignite Seattle event on Thursday March 1st at the Egyptian theater on Capitol Hill. it’s an evening of great short talks on interesting topics and you should come to cheer me on! You can buy tickets now, and act fast as they usually sell out. Hope to see you there. We capture and publish videos of all talks and post them online in just a few days. We want to help you to get your message out as best we can. 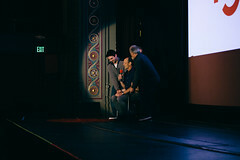 You’ll receive an email a few days after the event with links to all of the talks, including yours. Find your video and post it everywhere, Facebook, Twitter, your blog, your neighborhood newsletter – your friends and family want to see it. We will also post photos from our staff photographers that you can share with your friends and social networks. One of the requirements for speaking at Ignite is your slides must automatically advance. It’s wise to practice many times before doing an Ignite talk, and this post shows you how to set up your slides for this purpose. Slightly further to the right, click on the “Apply To All Slides” button. Now start your slideshow from the beginning, wait 15 seconds, and presto! Make sure you only have 20 slides (equivalent to 5:00 of presenting time). You don’t want to be rehearsing with more slides than are allowed. We do everything we can to select speakers with great topics and passions, but we also work hard to help them prepare. As the Ignite Seattle speaker coach I run a session where we talk about common mistakes, tactics for preparing and how to develop a great story. It’s informal, fun and we usually feed people (hungry speakers are bad speakers). We also encourage folks to do a dry run improvisation with us to get feedback early on in their process. And of course speakers at Ignite are interesting folks and the session is a chance for them to get to know each other. We tell speakers that since they’re speaking about something they know well and are passionate about, they could probably spend time thinking carefully about 4 or 5 stories or messages and simply practice and present that, without any slides, and do fine. We strongly recommend people develop their ideas, points and stories before they make a single slide. What you say and how you say it is by far the most important thing. Here are the slides I use that covers the basic advice, including showing speakers photos of the stage and what to expect once they’re up there. I love Profanity! The surprisingly difficult choice. Ignite Seattle is a special event, with one of the largest (800+) and most engaged storytelling audiences you will find in our city. We take open submissions for talk ideas and want to help you to pitch us well. This post explains the best possible advice for getting your talk accepted. Talks are strictly 5 minutes long with automated slides. You can speak about anything, but all talks must consist of 20 slides, each timed to be on screen for 15 seconds, for a total of 5 minutes (Similar to Pecha-Kucha). It’s an exciting and dynamic format and if you’ve never seen an Ignite talk, watch some. Don’t worry too much about slides, it’s you and your story or lessons that matter most. There are only 12 slots / we average 60 submissions. This means far more people are rejected than accepted. This is competitive, so bring your A game. Show it to a friend and get their feedback. But don’t take it personally if you’re rejected – these slots are precious and you’re competing with Seattle’s best. 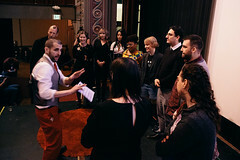 The organizers meet to vote on who gets accepted. We review all submissions, mostly blind except for the title and description, with a short window of time for discussing each submission. We quickly filter out poorly written, under-thought or vague ones. Your submission will be reviewed in a huge spreadsheet (shown below). Submissions that are concise, clear, compelling, smart or funny prove to us you’ll do well in the Ignite format, where you’ll have similarly tough constraints. 98% of speakers at Ignite are glad they did it. Ignite is challenging but a great professional and personal opportunity. If you’re going to submit, do it right. Spend the time necessary to come up with a great title. By demonstrating you can name your talk something simultaneously descriptive, informative, compelling and perhaps funny, you prove you’re worthy of a slot on our stage. Ignite is about concision. Show us you’re good at this. By working hard on the title I promise you, the talk itself will improve. When the organizers meet to review submissions, we look at a giant spreadsheet of the submission data (see below). It’s overwhelming. An easy way to cut through the noise is to give us a strong quality signal in your title. Good titles distill big ideas into a single, easy to evaluate sentence. We read the descriptions of course, but nothing gives us more confidence in you than your title. These titles express an interesting angle on a topic. These angle choices can make a seemingly boring topic suddenly fascinating. It’s easy to imagine what the talks will contain, and even when it’s hard to imagine, they are compelling enough that we’d want to find out. A good title is 50% of your proposal, but a good description is the other 50%. A great proposal description balances our need to understand your story with the need to be concise. If you’re accepted, we can be mysterious and vague when we promote your talk, but please don’t be mysterious and vague with us. If you have 3 points to tell the audience, tell us what they are. We don’t have a hard word limit, but aim for under 150-200 words. You don’t need to detail every point in your talk, but don’t leave us wondering what you’ll be talking about. Description: The slowest gazelle gets eaten by the lion. In the world of cybersecurity, you are probably one of the slowest gazelle. Unless you’re a movie star, a CEO, or a politician, you probably don’t need to be in the front of the pack. Just safely in the middle. Luckily – it’s real easy to get to the middle of the pack. There is ONE thing you can do that will drastically enhance your personal security and safety on the internet – and that’s using complicated, unique passwords on every account and saving them with a password manager. Many people give advice. But I will tell you the secret to actually getting it done: identify the most important accounts and do those first. Description: There was a time once when I had to make a tough decision, but couldn’t decide what to do. I went to a cafe and ordered some toast with butter. While I ate it I came to an incredible realization about my quandary. As I crunched on that last bite of toast, I realized what I needed to do. And that realization set into motion a series of events that changed my life. That cafe changed my life, the lessons I learned my work for you too. There are no restrictions on your choice of topic. If we’re convinced you’re telling a great story, any topic goes. Over the years we’ve had one armed jugglers, street musicians and some dramatic personal stories that would be appropriate for The Moth or This American Life (if they were on speed). We’ve had topics that range from video games to Ultimate Frisbee, eating bugs to how to write a song, and once even had two speakers get married on stage (in 5 minutes). It’s okay not to have a takeaway from the talk. We’re not TED, and not every talk has to be actionable. Speaking of which, we’re not TED. Don’t feel like you need to be a professional speaker or be a leading expert in a world-changing topic to qualify to speak. We want proposals from normal, everyday people. Talks pitching your product, startup or consulting business will be automatically rejected. Don’t even try. We’ve made this mistake in the past and everyone in the audience knows in 10 seconds what you’re doing and they will hate you for it, and us for letting you on stage. We do want you to promote yourself, but solely as someone who has given a great Ignite talk. It’s ok to tell your story provided it’s not centered on selling something. We have had speakers talk about something they invented or how they started a company (Rich Johnston from Vertical World) or a non-profit organization, but the focus was on the lessons and stories, rather than promoting anything. Think of your talk as a self-contained creation, and not a tool for some other purpose. Submissions typically close six weeks before the Ignite event and the talk submission form to fill out is always found here.